Family Kabins not only builds outstanding log cabins, we have a long history of building gazebos, arbors, and decks. 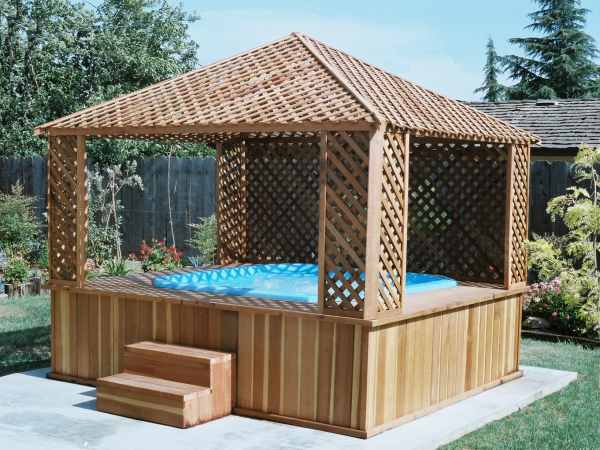 These custom-built outdoor wood structures enhance any exterior space, such as walkways, driveways, backyards, patios, pools and gardens. Home owners like a gazebo because they offer shade and shelter from the hot sun, while remaining open and airy. These octagonal structures are often seen in gardens, parks and other large areas creating a small pavilion. Included in the gazebo family are pergolas and arbors, which we can custom design to coordinate with a new or existing veranda, patio or fence structure. From wedding pergolas to enclosed gazebos with lattices to arbor gates, you can modify any standard gazebo and arbor design until your unique vision is achieved. We offer a large menu of possibilities and can help you design the backyard, garden or recreational area of your dreams. Call us today - (406) 788-6990!